Since being diagnosed with Crohn's disease I have found I have a lot more time on my hands (Mainly because I lost my job in October!) and I always feel it is important to keep myself busy. I absolutely hate being bored, it is almost a bit of a phobia. Normally under these circumstances I would read as I can normally wile away many an hour by reading however, I have been really struggling to concentrate on any book, including my go to classic trashy novels that I have read and re-read numerous times. So "how are you filling your time" I hear you ask? 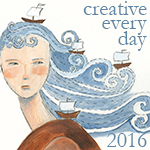 Well I have been spending my time profitably (which for some reason seems very important), by firstly joining the Creative everyday challenge. This is where I came up with the idea for the name of my blog post this time 'Art for healing' was January's theme and it got me thinking. Do I create art to help me heal? I suppose it could depend on your idea of art. What do you think? Do you use art to heal you or others? One thing I have done for years if I am ill is to look up healing herbs and spices as I am a believer of the idea that whatever ailment you have there is a cure and like with nettles the cause of the ailment and the cure are usually close together. Over the years I have turned to the book: The encyclopedia of healing plants by Chrissie Wildwood and I have found it fascinating how often it has helped me. 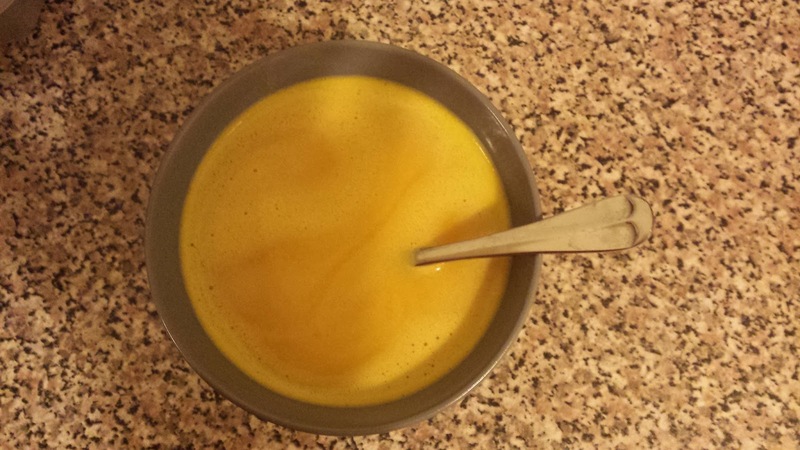 Easy things like if you have a cold use ginger and turmeric in your cooking (I would usually do a curry or chilli for tea). It is the foundation for modern medicine really though so I guess it shouldn't be that surprising when it works. Do any of you do this too, do you have any of your own 'natural' remedies for when your ill? Which brings me to cooking and food. For years I have struggled with Crohn's symptoms but not knowing what they were made it quite difficult and I just assumed I had a mild intolerance (and sometimes not so mild!) to some things. So over time I have restricted my diet to things that don't cause me problems (which is good as that is what they suggest that you do when you have Crohn's disease) and this has resulted in me having a bit of a love of cooking and I think cooking is a form of art too as it is the act of creating something beautiful. What do you think? Anyway, I thoroughly enjoy food and spend many an hour looking up new recipes to try (vegan of course), and amending them, so at the moment when I can't eat because of my stricture I am finding it a little difficult. However don't think that this has stopped me! Oh no! After all this is part of my ingrained response to illness "what can I eat to make me feel better?". 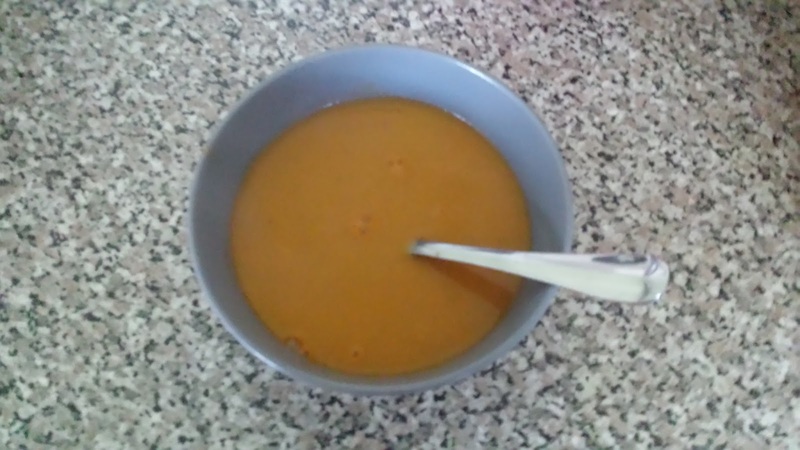 Below are two simple and easy recipes for vegan soups that were suitable for me and did not cause me any problems on my new liquid only diet! Remember if you are a Crohn-ie that everyone is different and these may not work for you. I have made this when not on a liquid diet and I have to say it is very yummy and was just as nice even though it wasn't the right texture. I made this as I really fancied my homemade vegan stew and obviously chunks of vegetables are definitely not liquid. As I don't know whether I am allowed to have potatoes I didn't add any to be on the safe side but I would normally. I used frozen veg which made it very quick and easy to do. This leads me nicely on to the other thing that has been occupying much of my time recently and you probably already guessed that that is my crochet? The whole thing of crochet is a bit like cooking I guess. You need the right ingredients, there is special books on it, there is also specific sites just for other people like you. Excellent! Ravelry is the place to be and if you have never looked at it and are interested in crochet, knitting or sewing then this is the place you should head to! I love it, so many patterns and in the words of Willy Wonka "So much time so little to do, scratch that reverse it"
I am a crocheter that likes to find a decent pattern and make it over and over again until I know it off by heart and can make it in my sleep, Why I hear you ask? I don't know but that is what seems to work for me. 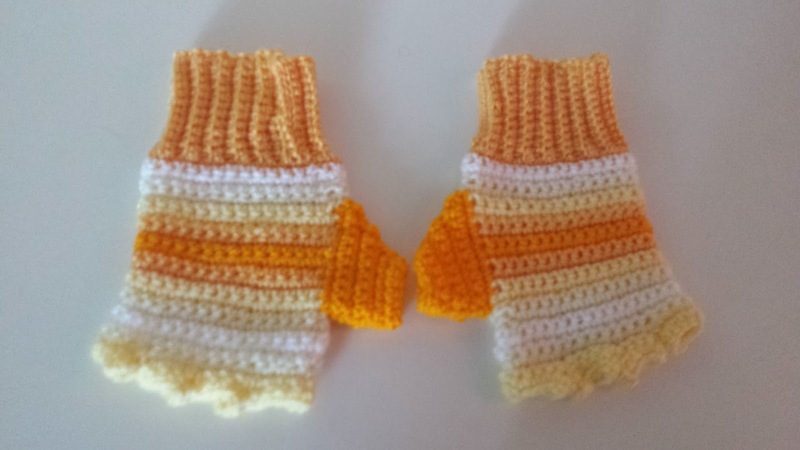 So when I found this fantastic Fingerless or not glove pattern on RavelryI was just super made up. It has everything I want in a glove pattern, it is simple and easy to follow and more importantly allows me to make each pair of gloves unique. 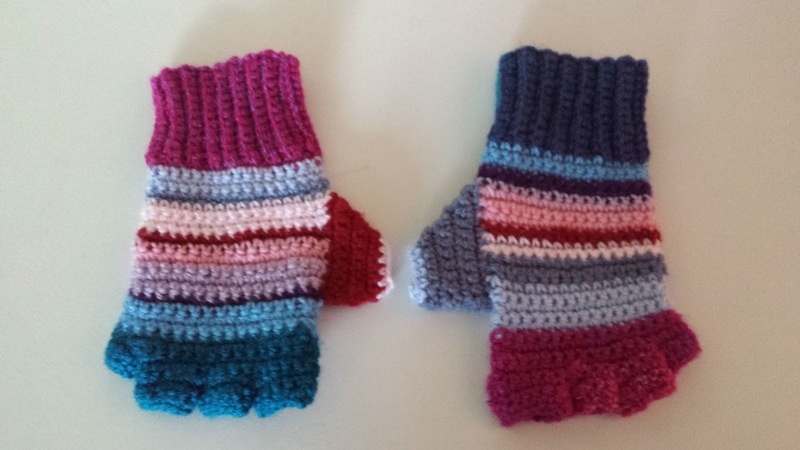 I have made three pairs this year to use up my scrap yarn and I am sure that I will not be stopping there! 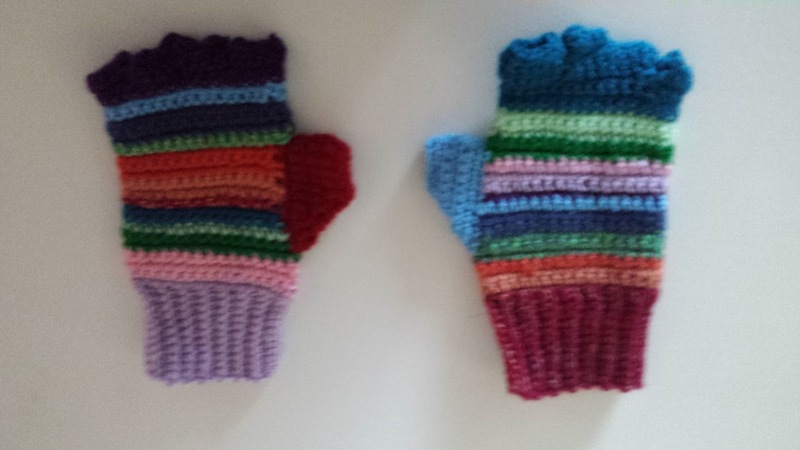 I made them fingerless as it is starting to get a little warmer now! You will have to tell me which is your favorite of the three as I can't quite decide which colour way is best!